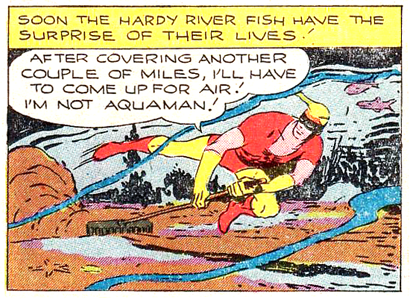 While chatting with #1 Aquaman Fan (and F.O.A.M.er, of course) Laura Gjovaag for an upcoming episode of The Fire and Water Podcast, she mentioned that Aquaman was referenced in a 1940s Johnny Quick story, quite possibly the Sea King's first-ever mention in the greater DCU. I had never heard of this, and somehow missed Laura's post about it over on her Unofficial Aquaman Website--so here it is! Aquaman (in)famously did not appear on DC comic book cover until The Brave and the Bold #28. His first official crossover with another DC hero took place just a few months earlier in Adventure Comics #267, when he met his longtime book co-star Green Arrow. But to my knowledge there was never any inkling that Aquaman was connected to any other DC character between his debut in 1941 and 1959--but thanks to Laura I'm happy to learn that's wrong! This Johnny Quick story was written by Joe Samachson, who also penning Aquaman's More Fun adventures at the same time, so this can be chalked up as a nice little gag for readers. And nerds like me, eight decades later. Both were also co-created by Mort Weisinger too, so that may have been an influence too. I had no idea about this either. It's really cool!